In NSW our quarry customer is continually at the forefront in quarrying aggregate, limestone based building and construction materials. Routine production at the quarry sees limestone conveyed on 900 and 1200 conveyor belt widths. The site had previously utilised standard return rollers and simple tracking idlers to effectively convey bulk materials. A thorough review of the site’s operational productivity was conducted and the maintenance team were keen to investigate the possibility of implementing a better guide to lead into the tail drum and further promote continuous productivity on site. Over time the lack of adequate belt tracking eventually caused the conveyor belt to misalign and run off centre. 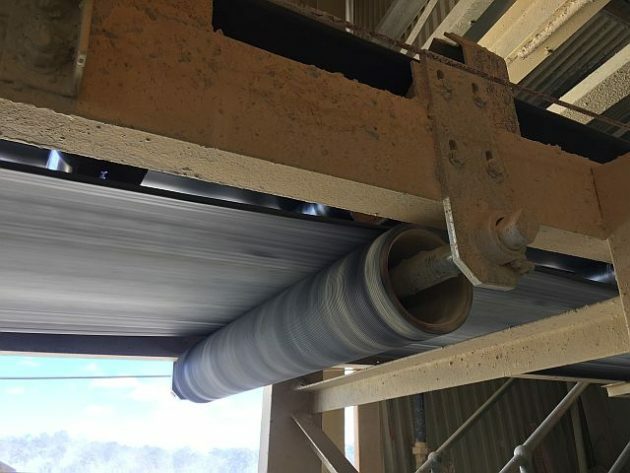 Further to the issue of conveyor belt not running true, the eventual result was costly damage to the conveyor belt, compromising the integrity and effectiveness of the conveyor to perform its intended function. Production down-time was also factored in to repair the conveyor belt which in turn impacted on the operations profitability. A detailed evaluation of the quarry’s current operation was conducted and the site’s inherent belt tracking problems were clearly identified as focal areas for resolution. Kinder Australia were given the task of maximising on-site reliability, productivity and reducing operational costs with the K-Commander® Self-Centring idler selected and installed. True belt tracking relied on the K-Commander® Self Centring Idler being installed on the return side of the belt being the most critical point of the conveyor belt to maintain correct alignment. Kinder Australia’s team of Field Applications Specialists were highly proactive and responsive in the recommendation and installation of the K-Commander® with the entire process orchestrated with ease and simplicity, taking no longer than three hours all up. The adjustable mounting brackets also important, were fitted to facilitate the simple installation process. Quarry maintenance team are thrilled to report, “K-Commander° Self Centring Idler is fantastic and has definitely helped with improving reliability on the plant”. With the installation of the K-Commander® Self Centring Idler the site has dramatically reduced potential disruptions and production levels have reverted to normal levels. The installation of K-Commander® Self Centring Idler delivers a powerful solution that effectively and efficiently trains the conveyor belt to run true and centre. Kinder Australia’s belt tracking solution has proven so successful that the maintenance team have given the approval for the belt tracking solution to be rolled out within six other key areas of the plant, predominantly on the tail drums.